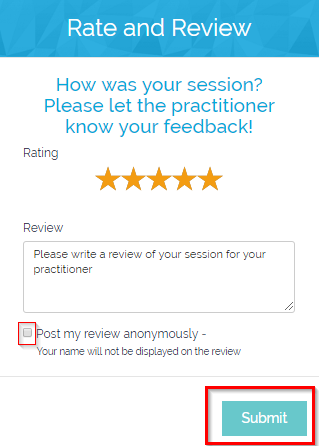 Here are two simple steps to rate your session and write a review for your practitioner. Do not immediately close your browser after the session because as soon as your session ends, a pop up for rating and review will appear on your screen. Considering your privacy our priority, we allow you to submit the review and rating anonymously. Simply click on the checkbox after giving desired rating and writing the review and click on submit. Your Review will be posted anonymously. What if I have closed my browser or I have logged out of my account before the pop up could appear? Don’t worry! Go back to Healing Clouds and log in to your account. The pop up will appear once again. 2. Once you see the pop up, please click on the desired number of stars to rate your session out of 5 stars and in the blank field below you can write the review. After writing the review please click on ‘Submit’. And there you are! The rating and review will be immediately published on your practitioner’s profile. You can confirm the same by click on their profile page. In case you didn't get any pop up after few minutes of ending the session, please send your rating out of 5 stars and review through email at info@healingclouds.com We shall get it published on your practitioner’s profile within 24 hours.